Click the box, and select from the date options. Click the box, and select to the date options. Step 3 Select the date of your trip here. You may tick to if you have an idea of your return. A box will turn active then you will be able to select your date of return. Step 4 Select the number of passengers for your group. Choose from the box the number of persons in your group. Note: Passengers that are labeled “Adults” have to pay the fixed rate for their trip. 5-years-old and above are considered “Adult Passengers”. 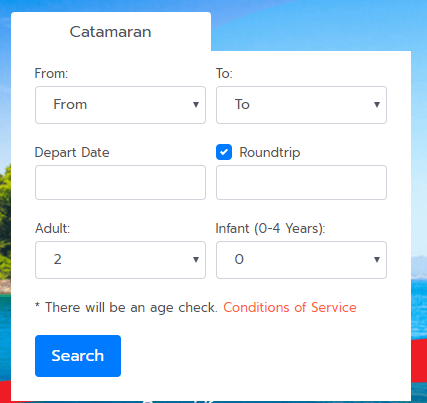 If you have “infant passengers” (considered they are 0-4 years-old) that you want to bring to your trip, you may select here to tell our system how many they will be with you during your trip. Note: Infant passengers are free of charge of our services but they must sit on your lap when the bus is fully-booked. They may seat to the seats if the bus is not full. The details of your trip will load in the next page. Step 6A. Book from the options. You may select the travel time preferable to your schedule or liking. 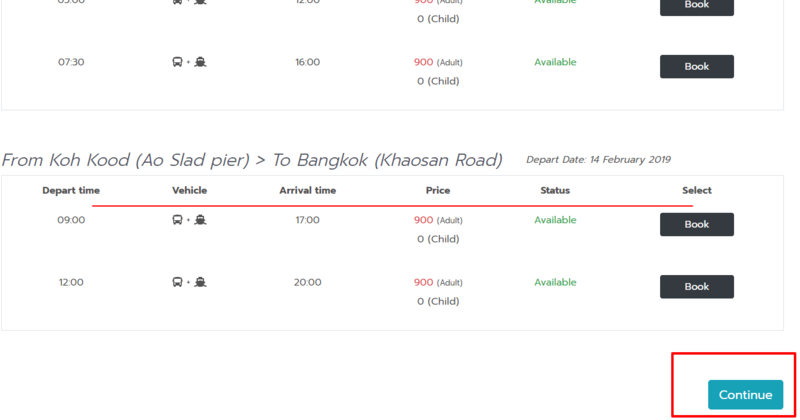 For example you wanted to book by 5:00 a.m. but it is already unavailable, you can select the 7:30 a.m. trip and click and it will turn green once selected. Step 6B. (If you have a return trip). Book for your return. Same instructions in Step 6A, you choose between the two time options given to you. 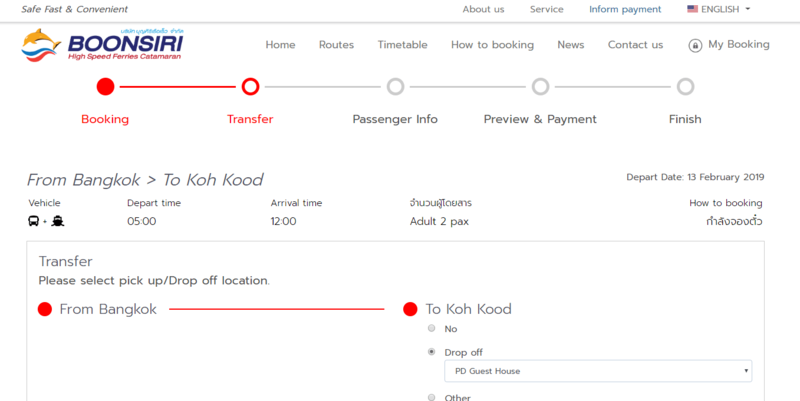 After clicking continue button, the page will load to the details of your transfer/trip. Step 8. Your transfer information. We always have free shuttle to drop you off to the hotel and/or resort you have booked. If you have not booked yet, we suggest you book with them first before booking with us. If you do not like to avail our free shuttle, then you can select this option. You can select this option if the hotel and/or resort is not listed in the choices. You can now type below the box the name of the hotel and/or resort of your choice. If you have a return trip, the instructions are the same. 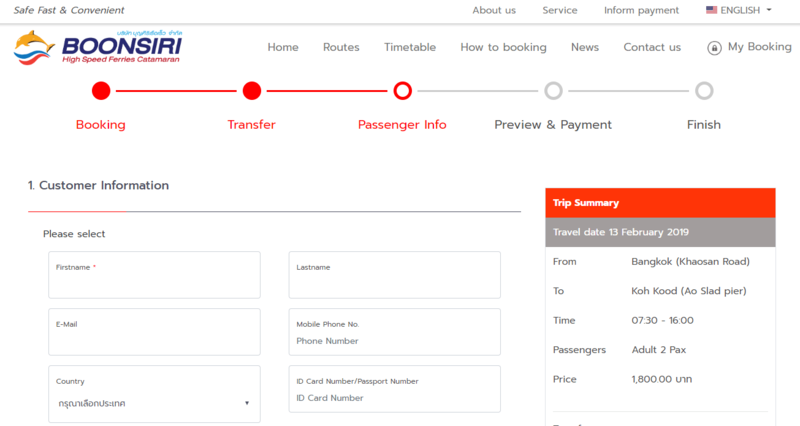 After clicking the continue button, the page will load to the page where you’ll be asked for additional details about your trip. Note: After filling out the form with the information being asked, proceed to step 11. Step 11A. Choose a payment method of your choice. 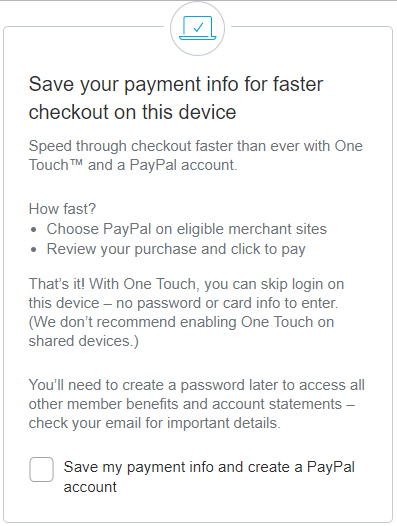 Note: If you chose PayPal, you will be redirected to their payment page to fill out other information regarding your payment. 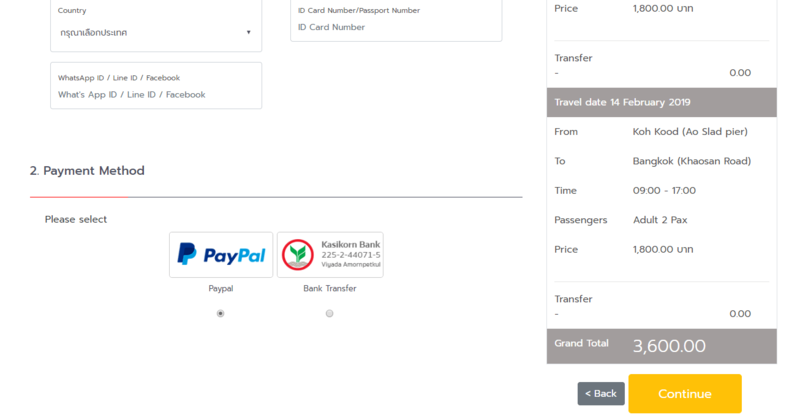 After filling out, you have an option to save your PayPal information for your next travel with us! 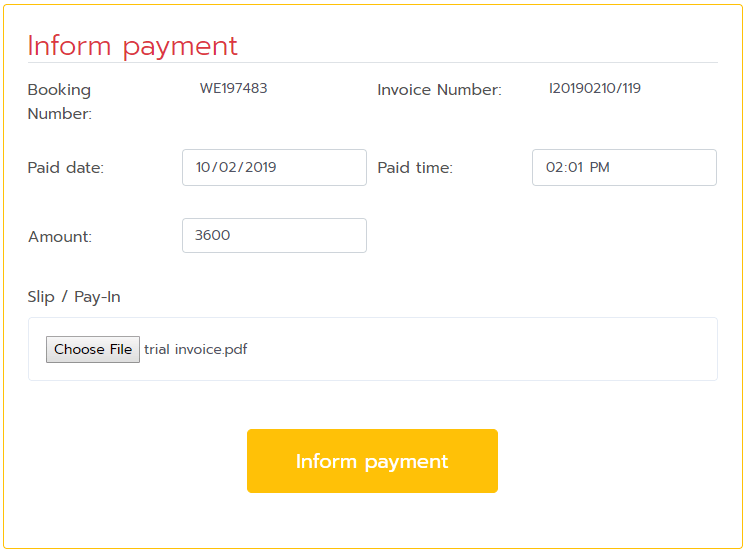 Note: If you chose Kasikorn Bank, you will be directed to the next page where you can find this button where you can download your invoice through clicking this button. Note: Save your booking number. This is essential if you want to have amendments with your trip. Amendments can be made by sending us an e-mail at: info@boonsiriferry.com or send us a private message in our Facebook page: Boonsiri High Speed Catamaran - Call 0616899222 EN, 0947244555. Note: This means you haven’t paid your trip or your bank transfer is still on the processing stage of wiring the payment to the bank account of our company. Note: Uploading your payment slip will reload the page with a green box which contains a message saying “Payment notification already Please wait for the officer to check the payment. And will send confirmation documents via email If not received within 12 hours, please contact immediately (contact us)”. Step 11B. Pay upon arrival. 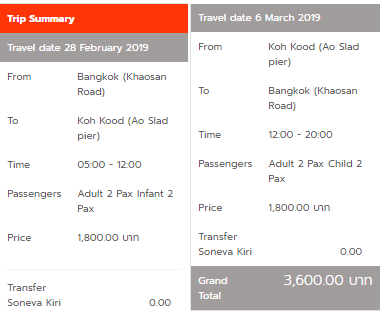 You can choose the pay-upon-arrival method if you don’t have a PayPal account or Kasikorn Bank account or, if you are not familiar with this methods. You can pay upon arrival at our offices. 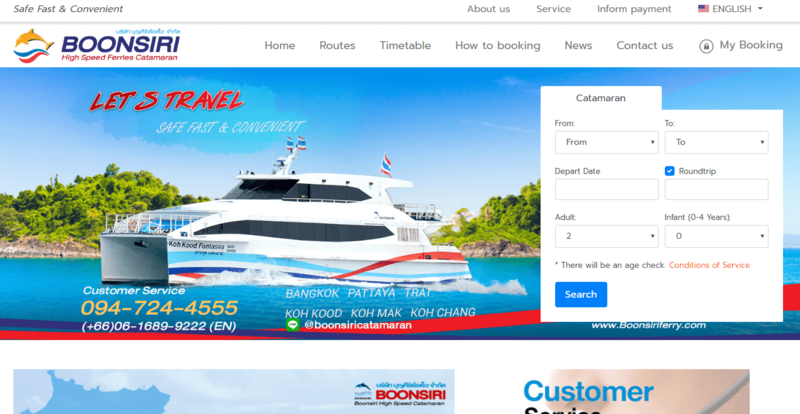 Just message us at Facebook: Boonsiri High Speed Catamaran - Call 0616899222 EN, 0947244555. Our customer service representative will take care of you from there on. Step 12. Save a copy of your trip summary. Saving trip summary on your notes will save us from unnecessary doubts later on. You can save it for unprecedented situations like changes on your flight schedule and etcetera.